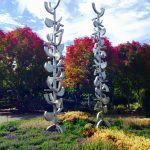 Join us for Art in the Garden, which features stunning art installations in the Garden throughout the summer! 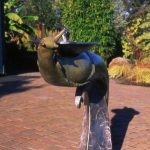 If you are interested in being a featured artist for Art in the Garden 2019 please fill out this form. Lauren does solo glass blowing, working alone without any assistants. Her studio is about the size of a small garage and is located inland from the Oregon Coast by about an hour. All pieces are handmade and one of a kind. Visit her website here. Bringing a new life to discarded agricultural materials. See more of his work here. David is a Native Oregonian who takes a lot of joy in the fact that all of wood is urban removed and therefore saved from the fireplace essentially. He harvests what would otherwise be disposed of and gives it a second life being enjoyed by many people. Visit his website here. Glass for me is a journey. Working in studios and with glass artists from Murano to Medford provides the artistic vision for the work displayed here. A resident of Silverton, Susan creates garden-inspired art made with love and grit in Oregon. View her work here. 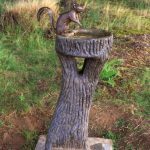 Karla has been making birdbaths and teacup art for over 10 years. She really enjoyed learning the mosaic process over the last 2 years and now likes coming up with fun, whimsical, mosaic art. Visit Karla’s Green Glass Design here. YaVonne, a resident of Silverton for over 5 years, creates art using recycled pieces. She finds her hidden treasures at thrift stores, garage sales and flea markets. Visit her website here. If you’re interested in becoming a sponsor for the 2019 Art in the Garden event, please email awoodson@oregongarden.org.